Is your daughter constantly hopping and bopping to her favorite tunes? Tired of listening to her nightmarish selection of mop-haired, adolescent crooners croaking out melancholy love songs or laments about parents who just don't understand? 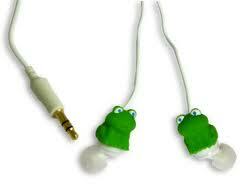 Show her that you understand it isn't easy being green with these Frog Ear Buds. Talk about your win-win situations! 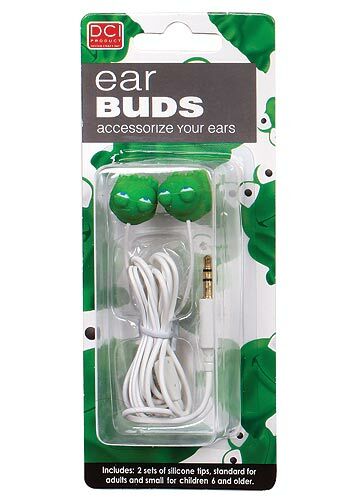 She gets cute ear buds and you get to reclaim your sanity! 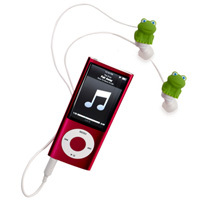 The Frog Ear Buds slide gently into her ear and fit any standard electronic device with a 3.5 mm headphone jack; found on most MP3 players, PDA's, portable DVD players, handheld game devices and laptop computers.